Back in October my gorgeous niece turned 1! My sister asked if I would decorate for the party as well as make the cakes, and of course I was more than happy to oblige. I decided a while back that I would work around an owl theme, because she had lots of different owl toys and because owls are just cute! 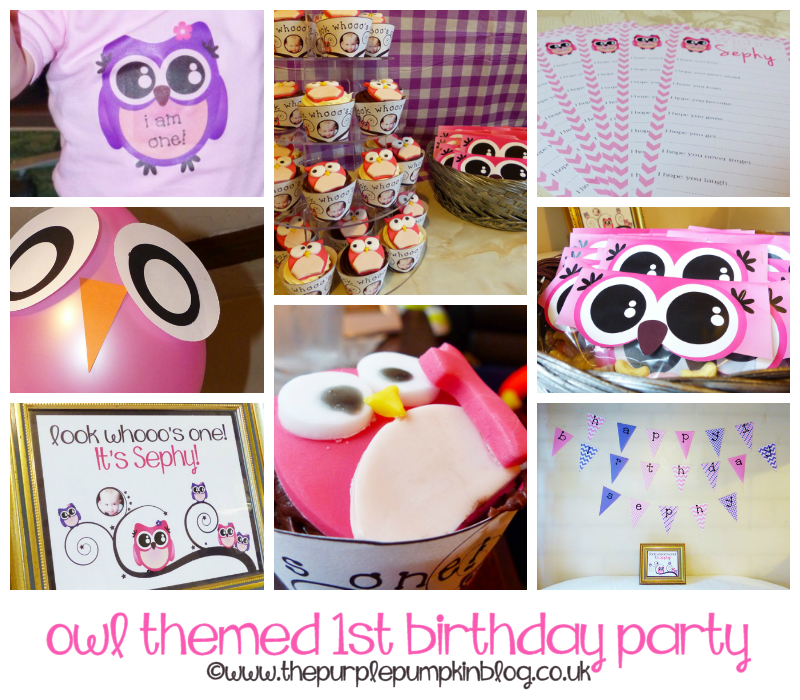 I shared the owl themed party invitations a little while ago, and only now have got the chance to blog about the party! With any party that I create at home it all starts with the invitation. Once I have a design with fonts and colours and the style I can then move forward and create all the other elements for the party. 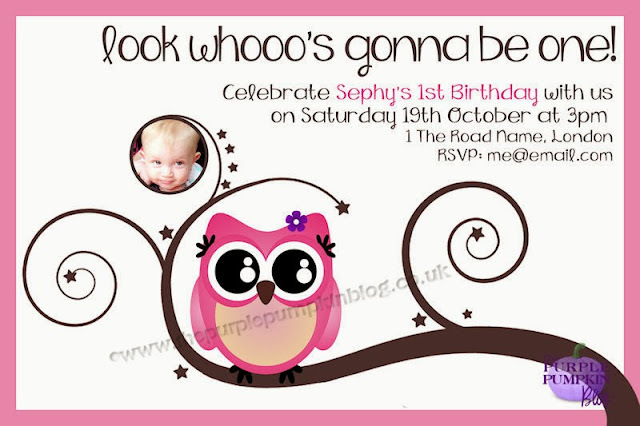 This party started off with a little pink owl that I designed and called Owlivia ^_^, she appears in both pink and purple throughout Sephy’s owl themed 1st birthday party – including on her clothes! I printed Owlivia onto transfer paper and was able to iron this onto a t-shirt for Sephy to wear at her birthday party – it was so cute and will be a lovely keepsake for mum to put away for when she is older. On the back of the t-shirt, I printed Sephy’s name and the number ‘1’ like a football shirt. Everyone loved it because it was so unique. I turned the invitation into a poster to put in a frame for the party…and something again that mum and dad have as a keepsake. Sticking with the colour palette of purple and pink I created lots of pennants in various styles to create a ‘happy 1st birthday Sephy’ banner. The party was held at my parents house and behind the buffet table there was a blank wall that the banner was able to be placed and it fitted perfectly. The only thing that bugs me is that I managed to get the letters ‘a’, ‘r’ and ‘s’ to all be in purple, and hung up it looks dumb haha! You may remember the Pink Flavoured Baby Shower I threw for the parents-to-be. I made a little notesheet called “Wishes for Baby” where the guests at the shower filled in wishes for the newborn. I amended and re-designed it and turned it into “Wishes for Sephy” and now that she is here as an opportunity to change/add to their initial wishes. Another great keepsake for Sephy and her parents to read over in the future. A very last minute decoration that I made whilst at mum and dad’s were these owl balloons – big circle cut-outs for eyes and a yellow triangle for the beak! We then hung the owl balloons from the ceiling. For simple party favour, I filled some bags with sweets and closed the top with a fold over tab of Owlivia’s eyes and beak! I loved how these turned out. Onto the cakes – little cupcakes with fondant owl toppers. I’d bought a cutter online and the owls looked so cute! On one of the cakes I added a number one in pink fondant – the cake that Sephy would be able to try and blow her first birthday candle out. Using the same design that had been used on the invites and poster I made some owl cupcake wrappers. Sephy was a little overwhealmed when everyone sang happy birthday to her, and mummy had to blow the candle out, but she was ever so careful with the cake and didn’t smash it! I know the trend is for a smash cake photo, but it just didn’t happen! After her initial shyness with the huge crowd watching her, she soon stepped out of her shell and was twirling around the room being silly! Dad made all the food for the lunch buffet so that was one thing that I didn’t have to worry about – especially since there were about 25 guests at the party! Sephy had a lovely first birthday – and lasted well without a nap all afternoon, but soon she was starting to feel tired and a bit crabby, so it was time for her to go home with all her new toys that she received for her birthday! If you are planning on an owl themed party I hope that this has give you some ideas! Gorgeous party, love everything about it. Awesome decorations, delicious desserts and love those owl balloons! Thank you! I loved setting up this party for my niece!